Stage 6 ended in a bunch sprint as expected, but we were right to look to take on Mark Cavendish. It is difficult to justify any rider being an odds-on favourite given the risks involved and it was demonstrated as Cavendish crashed with around 40km to go. 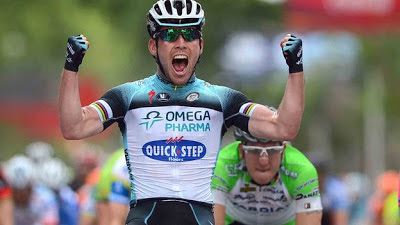 While he was able to get back into the pack and contest the sprint, the energy that it had taken to chase back to the group had just taken enough out of him and it was Andre Greipel that took the win ahead of Peter Sagan and Marcel Kittel. 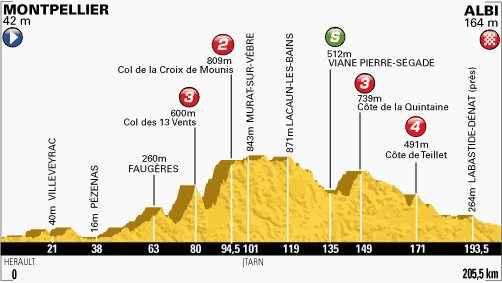 Stage 7 has four categorised climbs – a category 4 climb, two category 3 climbs and a category 2 climb. Despite this, it is still likely that it will come down to a bunch sprint. While there is a chance that the sprinters could be dropped on either the Col de 13 Vents or the Col de la Croix de Mounis, there should be plenty of time for them to get back to the peloton and the final two climbs are relatively straightforward. The sprint teams will look to chase down any breakaway in what is likely to be their last chance for stage glory before the Pyrenees. A strong headwind should make it very tough for a breakaway, so it would be a major surprise if this is not a bunch sprint. That brings us to the favourites. As with the last two stages, it is the same names that crop up. Mark Cavendish is tough to ignore, while Andre Greipel and Marcel Kittel also have stage wins to their name. With the slightly tougher nature of the stage, Argos-Shimano may look to keep the pace high and switch their focus to John Degenkolb, but he will struggle to beat the likes of Peter Sagan in a sprint, so my suspicion is that Marcel Kittel will be their main focus. Sky’s Edvald Boasson Hagen has two top five finishes to his name already and there is no doubt that he will make it over the climbs, while Alexander Kristoff has finished in the top 10 three times already and will be desperate for at least a podium from this race. If the pure sprinters are dropped, the likes of Ramunas Navardauskas, Davide Cimolai and yellow jersey wearer, Daryl Impey, could all spring into contention. In terms of potential breakaway winners, the usual candidates lead the market. Thomas Voeckler, Sylvain Chavanel, Thomas de Gendt and Juan Antonio Flecha are all strong riders that would fancy their chances of staying away or getting away near the end. However, with the climbs coming early in the stage and the strong headwinds working against the breakaway, it seems likely that this will be a bunch sprint. In any sprint stage, the first thing is always to look at Mark Cavendish. He should get over the climbs today, or be able to rejoin the peloton, and as a result, the odds on him look quite tempting today. Covering Peter Sagan is also wise in case the pure sprinters are unable to stay with the peloton.